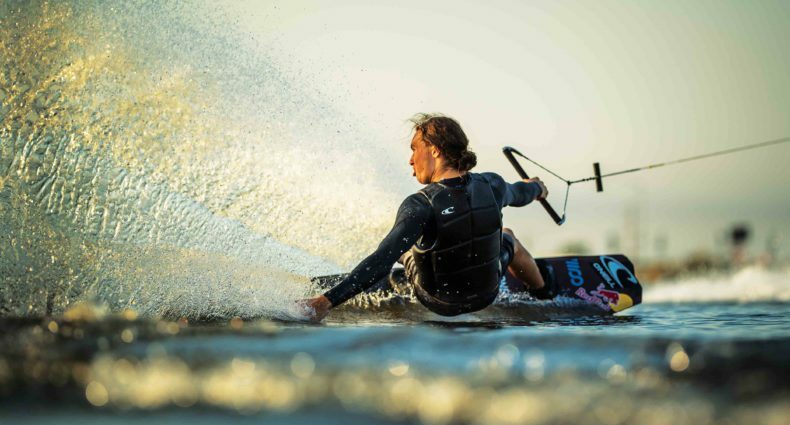 What: Wakeboard photographer Josh Thompson’s work on Display. Following an epic winter season on the West Coast we are all having a hard time saying good bye to early mornings and record breaking snow fall! It’s the time of year where we’re still teetering on the edge of wanting a few more good days on the hill and pulling out the full suspension bike and the boat. Nonetheless, there isn’t a better time to pullout the flip flops, the bbq and rally the crew for a good ol’ showing of wakeboard photography! Evo opened its doors for yet another artful evening of “First Fridays” featuring wakeboard photographer Josh Thompson. All the regulars were present and accounted for and a mash of new faces were down for a good tease of 2mm tops, and green trees lining the shores. Amongst some of his shots you’ll see familiar NW features such as Lake Sammamish, Bellingham Bay and can’t miss the rad rail shot from Qwest Field! Get ready ladies and gentlemen cause it’s on! Although Josh has been shooting snowboarding (professionally) for the last 11 years and has worked with just about every magazine out there, he has been shooting more wakeboarding over the last three years. He lives and shoots in the Northwest and often works with the Ennen Brothers. Washington State has some amazingly beautiful lakes and bays which all have something different to offer so he’s shot from Diablo Lake high in the Cascades and Bellingham Bay to small man made lakes such as Bow and Koppert. He has worked with companies such as Liquid Force, O’Brien, Wakeboarding mag, Red Bull and Alliance Wakeboard mag. If you didn’t get to come by for the event on May 4th, don’t sweat it! We’ve got some photos and a little video clip featuring the gallery and a few words from Josh himself ! Better yet, the evo gallery will be featuring Josh’s work throughout the month of May so come and get it! Check out the photos and video @ www.evoseattle.com/community.htm. For more about evo and the hookup on all your favorite wake brands, www.evogear.com.